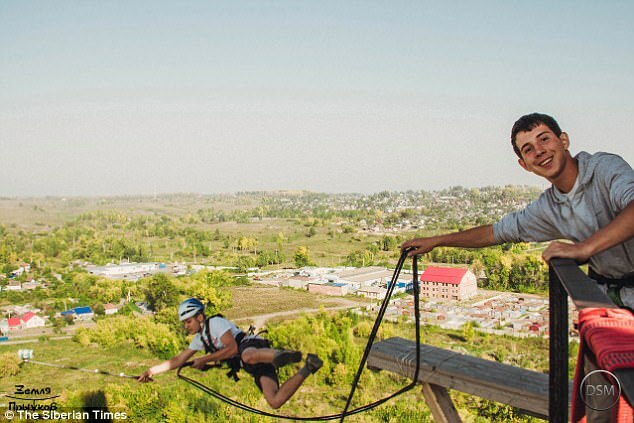 The craze has been called bungee jumping without the bounce and gives a feeling of weightlessness as participants swing from side to side from a rope hung on the bridge's underside. 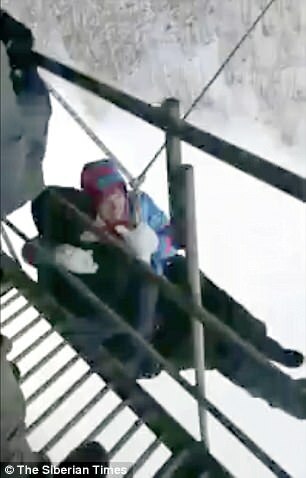 The couple are seen on video hugging each other and joking as they prepared for their jump over the frozen River Tom. They screamed in excitement as they began to fall. There is a short, painful shriek as - a second later - disaster struck as they slammed onto the thick ice below. A man on the bridge gantry filming their £4.50 jump immediately blamed another man, screaming: 'I'll kick you down there too!! 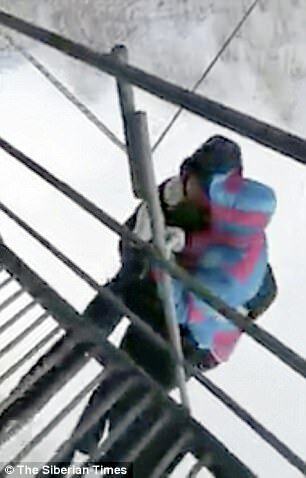 A second video shows the couple lying apparently unconscious on the ice. The rope is still attached to the man. A small blood stain is seen close to their motionless bodies. Rescuers waited for specialist paramedics to reach the scene before moving them. Emergencies worker Ivan Temerev, said: 'We received a call around 2pm asking for urgent rescue service. 'When we arrived, we found two injured people next to New Bridge on the left bank of the River Tom. 'A young man and woman were rope jumping, but at some point their fall trajectory went out of control. 'Both jumpers were seriously injured. 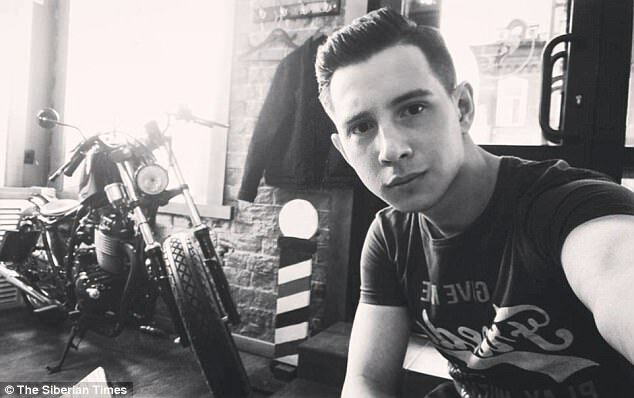 The Russian Investigative Committee - which probes serious crime - started a criminal case into circumstances of the jump. When successful, the jump has been described as swinging from a rope the height of a seven storey building. The organiser of the jump was named as Mikhail Kholbutaev. He was hit by a social media storm today. 'That's it mate, time to pack up for jail', read one comment. He could face up to two years in jail if convicted of carelessness over the incident.